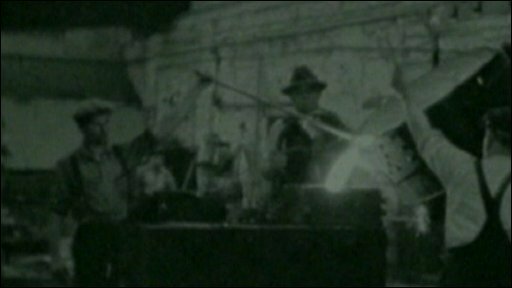 Archive film footage dating back to the 1920s has been rediscovered in Cornwall. As well as producing mining equipment, Holmans of Camborne also had a film unit. It recorded day-to-day life in the factories, before the industry declined. When the factories closed, Holmans left behind 160 reels of footage. This has recently been re-digitised by Cornish company Azook. The film is now being toured around the county in the hope that someone will recognise the faces from long ago. Walking around Camborne, it is very hard to find any trace of the factories and the mighty machinery that once made this town prosperous. In its heyday, Holmans employed over 3,000 local people, across three sites. Now the factories are in ruins - one has been completely demolished and replaced by a supermarket car park. And yet Holmans lives on here, thanks to the work of its film unit. Reels of footage dating from the 1920s to 1960s bring to life a thriving, bustling Camborne. As the footage flickers into life, scenes of office, factory and foundry workers appear. Men in flat caps and braces pour liquid metal from huge vats, men in suits perch in front of drawing boards, and women in flowered dresses skip down the office steps. I sit and watch the film with members of the Holmans Choir. They will be accompanying the film when it is shown at venues across the county this month. People start pointing and remembering the locations on the screens. "Holmans was Camborne," they tell me. Only 10 members of the choir are original Holman's workers, and what had originally struck me as a disconnected gaggle of men, is suddenly transformed back to the close knit community flickering on the screen, whose work and home lives were dominated by the factories. The choir are suddenly journeying back to a time when Holmans was great and no one could imagine a life without mining. Former worker Hiram Tresidder tells me he had been extremely honoured to actually meet one of the Holman family. "They had respect for their employees," he says. "And they had the same back from the employees, and it was a great honour to wear that badge of Holmans." Another, David Latham, explains: "I started my apprenticeship in 1970. And I grew up there. "I became a man there, if you like. I went from a boy to a man - and what more do you want, really?" One of the eldest members of the choir is Grant Hart. He has tears welling in his eyes as he tells me: "The greatest memory of Holmans is being a member of this very fine choir. "And I've been in this choir for 46 years. And that to me is something that no one will ever forget. Friendship." The screenings across Cornwall have been made possible due to a collaboration with the Trevithick Society, and support from the Digital Film Archive Fund, South West Screen and the Film Council Lottery Fund. They are keen to find out more about the footage, and it is hoped the people of Camborne will come forward with information. The memories will then be collected to provide a record for Cornish school children of their heritage. The Holmans choir will be singing at the screenings. Former worker Jim Geach tells me: "We are privileged and very humble to represent this county and its people, and it's the only thing that's left. And we stand shoulder to shoulder and sing with that name behind us. "And that is a very big privilege."